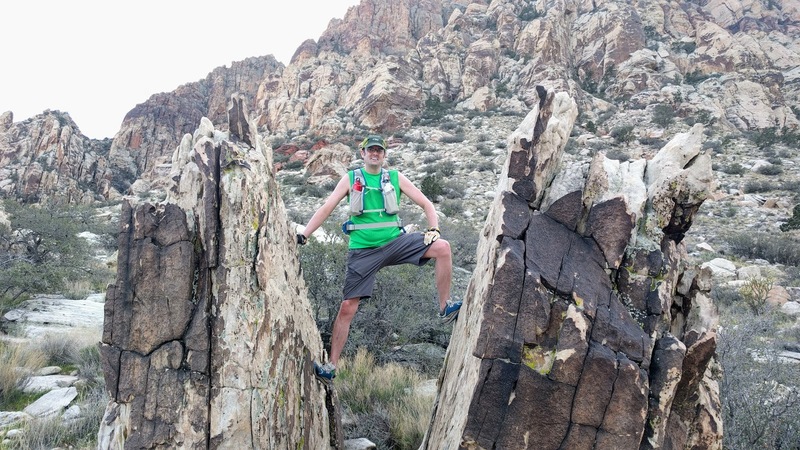 This past weekend, Jeff and I ventured out to discover a new trail! 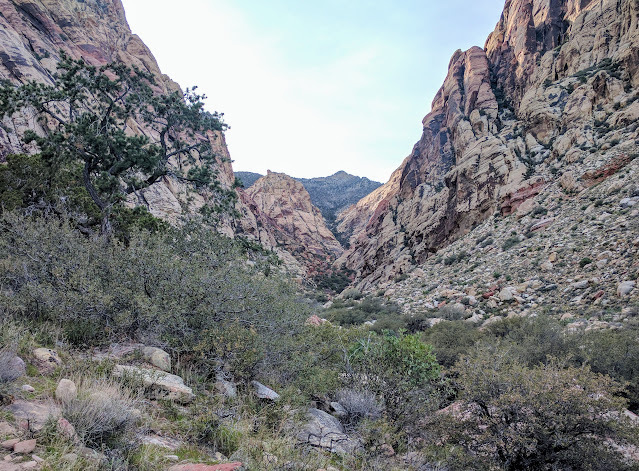 Our intention was to do a trail inside Red Rock National Conservation Area, but we got a late start and by the time we got there, the entrance into the park was closed. We assume it was because all the parking lots were full. It was a GORGEOUS day, after all. 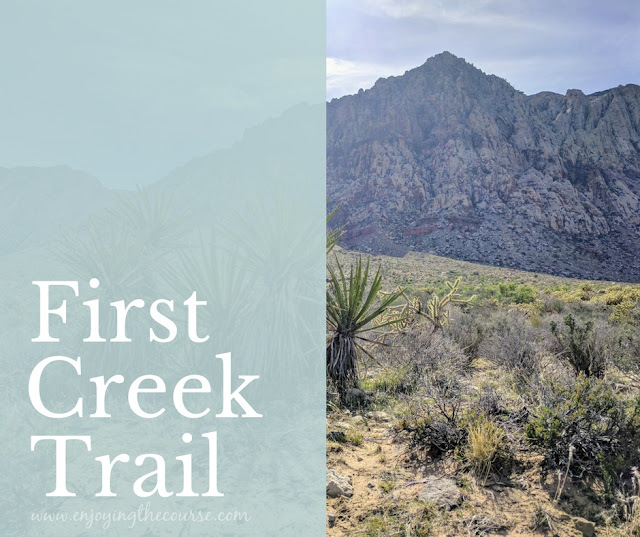 Instead, we headed to First Creek Trail. It's just over 4 miles farther down Hwy 159 from the entrance to the park. 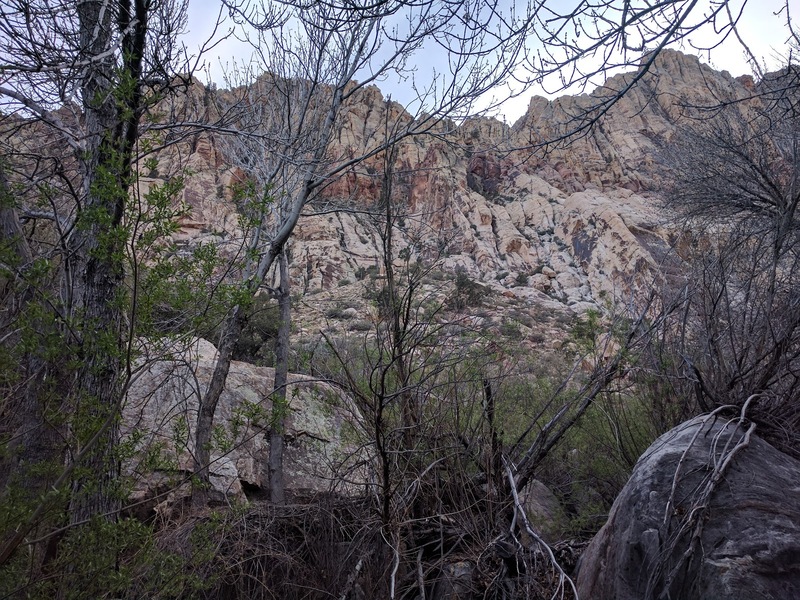 All of the parking lots along the highway were pretty crowded, but we easily found a spot at the First Creek Trailhead lot. This trail is marked Easy, according to the sign at the trailhead, or Easy-Moderate, according to the Red Rock Canyon visitor's guide. The sign at the entrance also says it is a trail system, which is pretty evident when you enter the trail and find a few different options of paths to choose. I think we decided on the most traveled one, since it was very well defined with trail markers indicating the boundary of the initial stretch. It didn't last long, though, and soon enough the trail markers were gone and we were faced finding our own way along the various well worn paths. 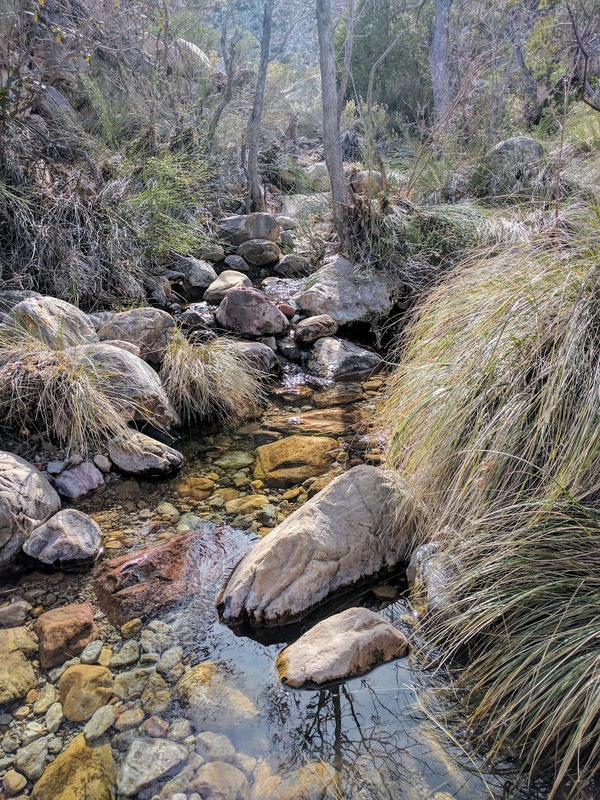 We walked along, listening for the sound of water of the nearby creek and were rewarded with a little pool. It probably won't be there for too much longer this season. 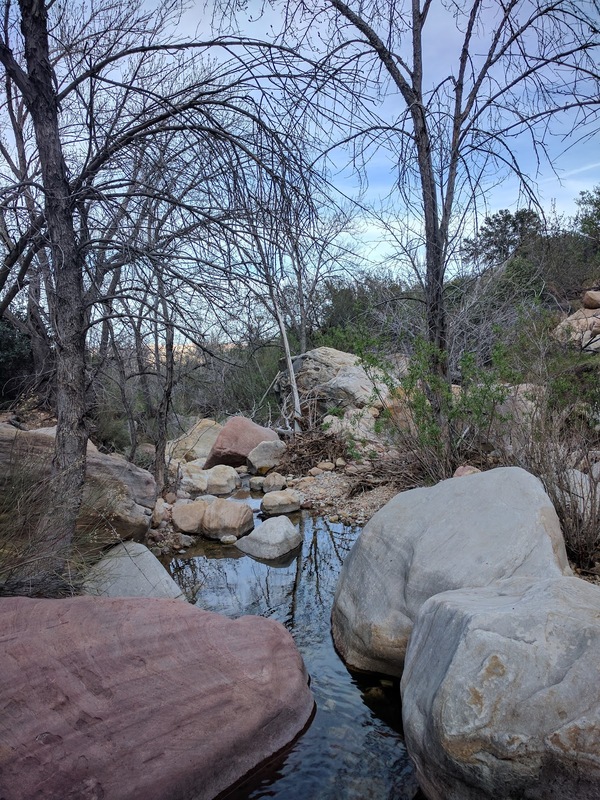 The creek is the highest January through March. 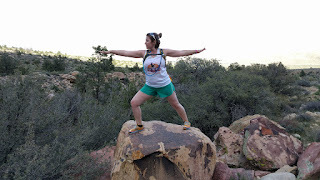 We went off trail for a bit and found this really cool rock formation. Jeff, of course, couldn't resist climbing up into it. 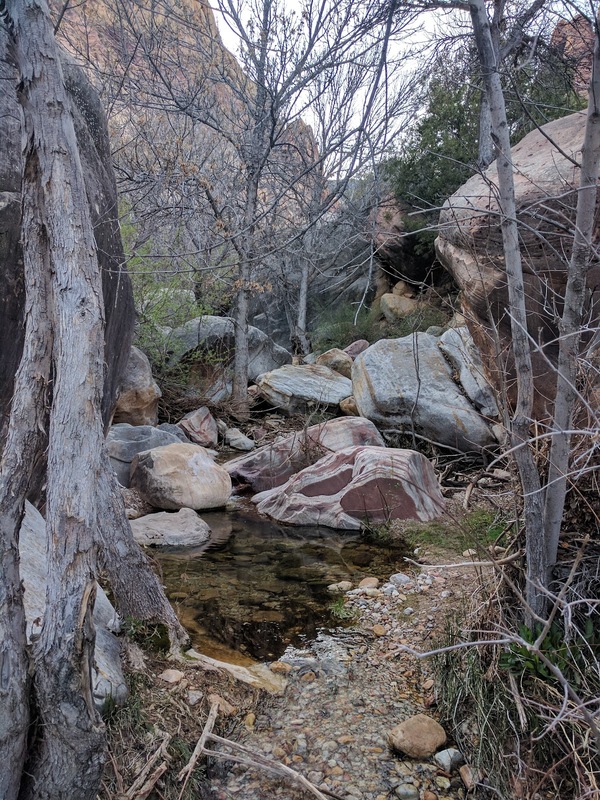 We found our way back down to the main trail and continued onward to try to find the beginning of the creek. 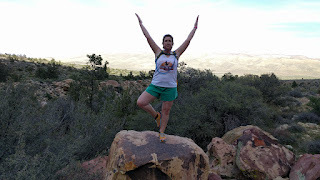 Along the way, we found this really flat rock, and I couldn't resist a couple yoga poses. 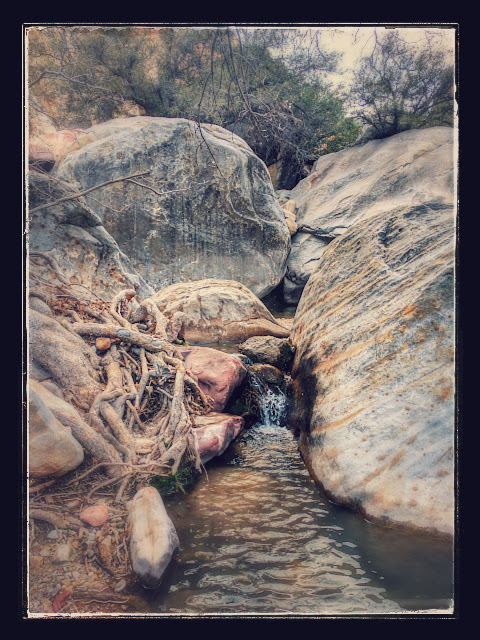 Not too much farther up the trail, we climbed down some boulders to find the creek. It's probably not the actual beginning, but it was beautiful all the same. We hung out there for a few minutes while we ate a snack and enjoyed the sound of rushing water. I explored down along the creek a little more. I'm really glad that we walked farther along the trail to find this part of the creek. The views and sounds were incredible. We headed back to the car, but not without snapping one final picture. It was definitely an afternoon well spent! Next time, I think we'll bring Sallie along. She would probably love it! 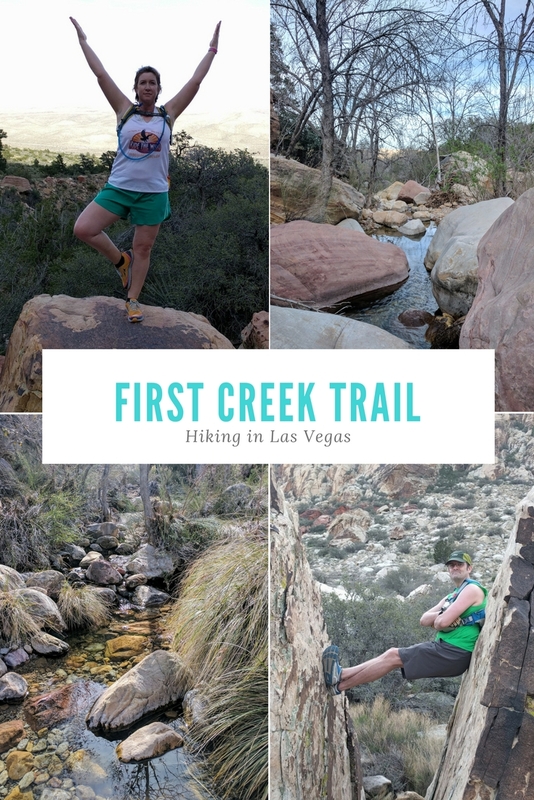 I would definitely recommend this trail to anyone looking for a relatively easy trail in Red Rock without the hassle of going into the park. While it isn't too strenuous, there isn't much shade, so be sure to wear sunscreen and bring plenty of water. That is amazing. We don't have anything even remotely like this in Florida, and it makes me jealous! Looks like you're getting great weather, too! That looks like a great hike! Love all the photo ops! 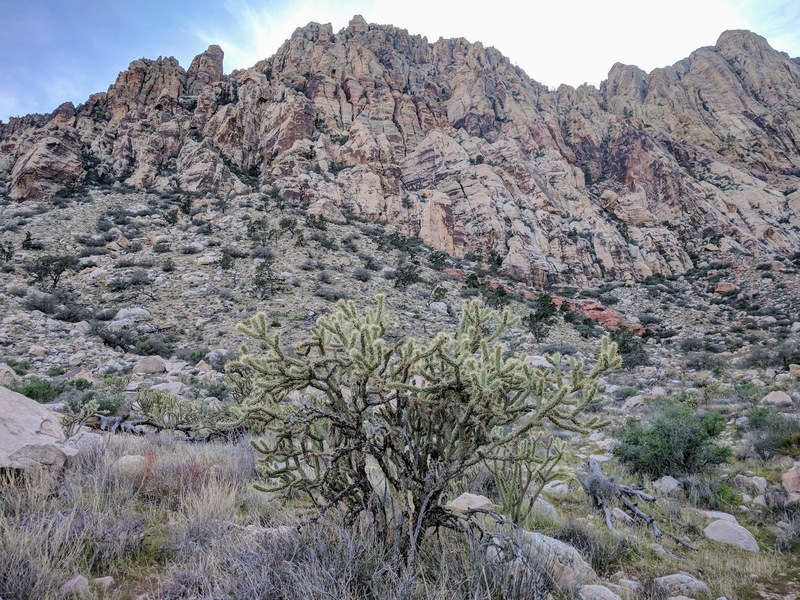 Vegas has some great hikes! Looks like a great trail to visit! This is awesome! I'll be in Vegas later this year so I'm bookmarking this. I love to gamble but the hubby hates it, so we'll need fun activities like this. It's probably 30-40 minutes off the Strip, but so worth it! I'll probably be posting other trails reviews throughout the month, so stay tuned for other ideas. Also, ICYMI, here are some tips to staying fit during a visit to Las Vegas. Wow such a beautiful trail and all those rocks!! There are some great boulders along this trail - and many of the other trails in the Vegas Valley. This looks beautiful! Awesome pics!!! You got some beautiful pictures! That looks like a super nice trail! and a great area for exploring! You are so lucky to have access to such gorgeous trails! When we were in Yosemite last April, my hubs and I enjoyed all the hiking and the beauty!!! Oh, yes! Yosemite is great. We went there back in 2009; it was so gorgeous! What a beautiful area for hiking! I can't wait for the weather to get nicer here so that my family can head out for some hikes together. That sounds perfect! Hope the weather gets nice enough for you soon. Oh my gosh those trails look absolutely amazing. So beautiful. They are so beautiful! Vegas does have some really great trails.